Modern gas turbine power plants represent one of the most efficient and economic conventional power generation technologies suitable for large-scale and smaller scale applications. Alongside this, gas turbine systems operate with low emissions and are more flexible in their operational characteristics than other large-scale generation units such as steam cycle plants. Gas turbines are unrivalled in their superior power density (power-to-weight) and are thus the prime choice for industrial applications where size and weight matter the most. Developments in the field look to improve on this performance, aiming at higher efficiency generation, lower emission systems and more fuel-flexible operation to utilise lower-grade gases, liquid fuels, and gasified solid fuels/biomass. 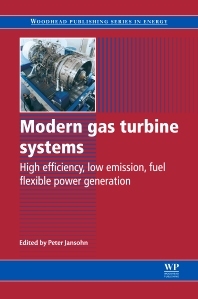 Modern gas turbine systems provides a comprehensive review of gas turbine science and engineering. The first part of the book provides an overview of gas turbine types, applications and cycles. Part two moves on to explore major components of modern gas turbine systems including compressors, combustors and turbogenerators. Finally, the operation and maintenance of modern gas turbine systems is discussed in part three. The section includes chapters on performance issues and modelling, the maintenance and repair of components and fuel flexibility. Modern gas turbine systems is a technical resource for power plant operators, industrial engineers working with gas turbine power plants and researchers, scientists and students interested in the field. Professionals, academics and researchers focusing on the efficient provision of energy. Dr Peter Jansohn is Manager at the Combustion Research Laboratory, Paul Scherrer Institute, Switzerland.